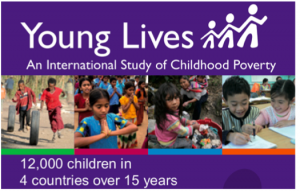 A new study by Young Lives researchers measures height for age of a cohort of children at ages 1, 5 and 8 years, in 4 countries: Ethiopia, India, Peru and Vietnam. The study uses WHO multicentre growth study standards at age 1 and WHO NCHS standards for ages 5 and 8 to generate normalised height for age z-scores (HAZ). An HAZ of less than -2 means a child is stunted. Notice the declines from age 1 to age 8 in Ethiopia and Peru and the declines in all 4 countries between ages 5 and 8 (when the growth standards are strictly comparable, i.e. both NCHS). "Our data demonstrate that while child growth trajectories throughout the pre-school and early school-age years are predicted in part by size at age 1 year, there is significant variation in growth after 1 year of age. This includes catch- up growth in some children and faltering in others. These results suggest that while prevention of early-life stunting must continue to be a top priority, programme planners and implementers should consider identifying and targeting for further nutritional interventions children who nevertheless become stunted during infancy, as well as children at risk for later growth faltering. An important area for future research is identifying the factors that contribute to these later variations in growth." I do think it is important to find out why some kids catch up in growth and others do not (since, as the authors report, 40-74% of HAZ at year 5 is not predicted by HAZ at year 1). I think it is also important to work out what is catching up. Is it more than height? Cognitive functioning, for example? We're interested in height not because it is intrinsically important but because it is a marker for other things that are stunted in the first 1000 days of life. An interesting study that reminds us not to give up on kids after the first 1000 days, but does not detract from the focus on this time period, it seems to me. Interested in your thoughts. which shows that recovery in linear growth was associated with better math, reading and receptive vocab scores. Does FAO really cheat on hunger numbers?